A field of Criollo '98 in the Jalapa growing region of Nicaragua. The Plasencia family is in the midst of its 2017–2018 tobacco harvest, which spans across Nicaragua and neighboring Honduras. According to the company’s records, this is the family’s 152nd harvest, and if you ask Nestor Andrés Plasencia, vice president of Plasencia Tobacco S.A., the current crop is exceptional. “The tobacco looks great in the fields and in the barns, too,” said an enthusiastic Plasencia. The seedlings went into the ground the first week of October and the Plasencias began harvesting the first primings of tobacco leaves the first week of December. This year, they are growing mostly Cuban-seed tobaccos like Criollo ’98 and Corojo ’99, but are also cultivating Connecticut seed, a few native varietals, hybrids and even some experiments with broadleaf. According to Plasencia, the 152nd harvest encompasses everything they’re growing for 2017–2018 in both Nicaragua and Honduras—a total of 3,020 acres with 1,200 acres grown under shade. 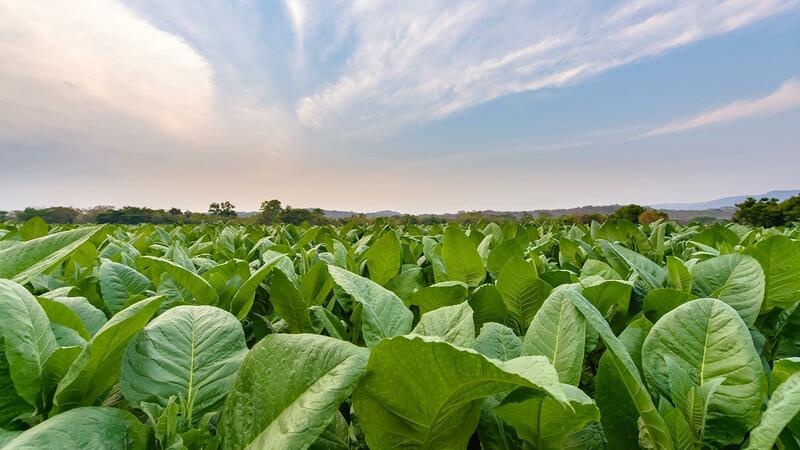 They’ll be harvesting tobacco until the season ends in June and anticipate an overall estimated production of more than 5 million pounds of tobacco, most of which will be wrapper leaf (about 70 percent by Plasencia’s calculations). The Plasencias are the largest growers of premium tobacco in Central America. They began growing tobacco in Cuba back in the 1800s, but have since relocated their agricultural operations to Central America. Not only do they sell tobacco to a large portion of the premium cigar industry, but also use the tobacco for their own brands, such as Plasencia Cosecha 146 and Plasencia Alma Fuerte, a full-bodied line of smokes whose Generacion V size earned the No. 9 spot in Cigar Aficionado’s Top 25 Cigars of 2017. They distribute these brands through their Plasencia 1865 company. This article first appeared in the January 9, 2018 issue of Cigar Insider.